Home/Why's & How's of this site/WordCamp Raleigh 2013! 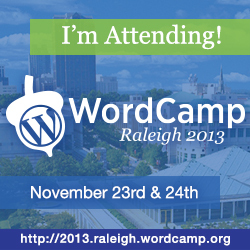 With my entire real estate website built around WordPress, I am delighted to see that the stars have aligned and I can attend WordCamp, Raleigh, 2013 Version. I have been unable to make it before, out of town etc, but I think I will be there this time. Previous PostPrevious JUMBO Rates are Lower than Conforming Rates?? Wow. Next PostNext Why Do HVAC Equipment Makers NOT Date ALL Their Products?